This post was originally published on December 8, 2015 on Money. A college diploma is no longer a luxury. By 2020, 65 percent of all jobs in the U.S. will require a postsecondary education. Sadly, rising college costs create the perception—and reality—that for many, college is beyond reach. Today, just over 43 million borrowers owe more than $1.2 trillion in student loans, with an average balance of $29,000—outpacing credit card debt and second only to mortgage debt. The good news is, broadband access and mobile computing are converging to make digital tools and apps available for students and families to identify scholarships and affordable college options. Flexible and online learning models allow learners to earn credit for existing experience and get their degrees faster. Colleges are using technology to help students navigate campus life and create efficient academic plans so they can finish in a timely fashion without racking up so much debt along the way. 1. Follow the money. Financial planning and scholarship search are becoming critical pieces of college counseling programs within schools and districts. Helping students understand the ins-and-outs of college costs, what it takes to pay for college, and where to locate money is the first step to ensuring students find the right match and prepare for long-term success. Scholarships, which are one of many sources of funds for college, aren’t just for students with the highest test scores. There are thousands of scholarships available for students based on their family background, geography, talents, or career aspirations. 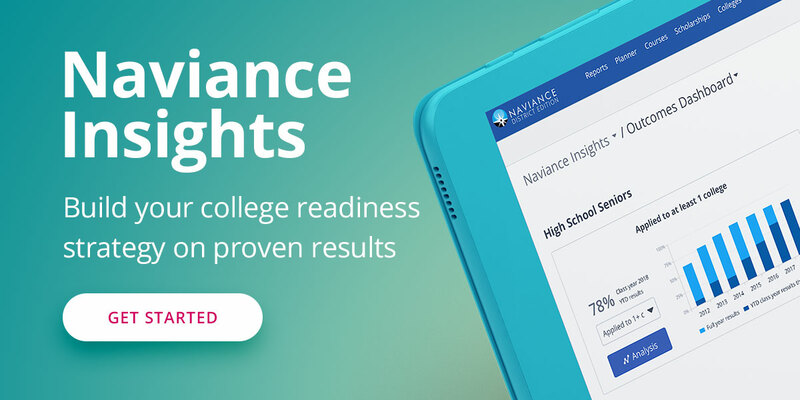 There are many free tools out there that not only help students track deadlines and award status, but also aggregate awards in searchable formats and provide insights students can use to enhance their chances of success. Last year, students in one Maryland school district used online search tools to secure more than $154.5 million in scholarships, with minority and first-generation college-going students receiving more than $47 million in offers. 2. Find the right match. College admissions can seem a bit like dating: It’s about finding the right match. With only 59 percent of students completing college in six years (yes, six! ), prospective students should pay attention to how quickly students like them earn a degree. Careful consideration of factors like academic rigor, geography, campus culture, and class schedules on the front-end can save students and families thousands in wasted tuition costs. Like online dating, technology is making unprecedented data available to help applicants make smarter choices. Technology also allows students to explore their strengths and career paths, helping them better understand the academic programs or majors they should be looking for in a college. 3. Pull double duty. More and more students are getting a jump on their first year of college by taking Advanced Placement (AP) and college-level classes in high school. Taking college courses early can help students prepare for the rigors of college—and save more than a semester’s worth of tuition. But not all schools offer AP courses. And for some high school students, taking classes at a local college isn’t an option. Today, online courses can make it possible for students to take AP classes after school—or even during the summer. Low-income students should check for AP test fee waivers. Most states now make it possible for high school students to take courses that apply toward high school graduation and general ed college courses. Careful planning and a willingness to take on an extra challenge can save students time and money. 4. Say goodbye to seat time. Online and blended courses now enable students to move at their own pace, racing through subjects with which they’re comfortable while taking more time with challenging ones. Over the last year, the U.S. Department of Education has approved some of the first online competency-based learning programs, from institutions like Capella University, Western Governors University, and Southern New Hampshire University. By enrolling in a college that offers competency-based learning, adult learners can capitalize on their real-world experience to accelerate their time-to-completion and reduce their tuition and fees. 5. Use big data for big decisions. Universities are getting smarter about using big data to identify student challenges early, and emerging technologies are making student help more accessible. Miss class twice? You may receive an email or a text from a college adviser. Struggle on a mid-term? Your professor may direct you to online tutoring. Smart colleges and universities are beginning to implement systems that can recommend classes and strategies that help students to succeed in larger numbers, find their path, and reduce the need for extra semesters or classes. Parents and students should ask admissions officers about how they use data and student support services to ensure students don’t waste time and money while working toward their degrees. 6. Look beyond books. The typical college student spends $1,200 on textbooks each year. At community colleges, materials make up 39 percent of total cost. Textbook rentals have been around for more than a decade, but with big names like Amazon and Barnes & Noble entering the mix, costs are falling even faster. Textbooks are also unbundling: Companies like PackBack now offer the “$5 textbook”—on-demand, pay-as-you-go digital textbooks. The growth of Open Educational Resources and emergence of new tools make accessing OER easier for students and faculty. Lumen Learning is enabling institutions to create textbooks made up entirely of open, free content, while Intellus helps faculty identify existing free or low-cost course materials for their students. While the headlines continue to bemoan rising college costs, innovations in college search, course-taking, and student supports are quickly empowering students to get a handle on college costs, making the promise of a postsecondary education possible.